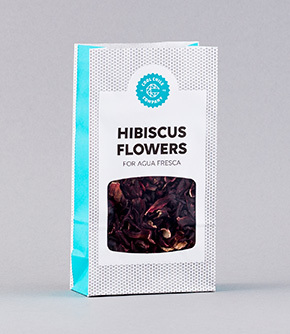 Dried Hibiscus Flowers – infuse to make flavoured water or tea. Known as ‘flor de Jamaica’ in México, this dried flower has a tart flavour similar to cranberry. It is most often used to make the refreshing drink, agua de Jamaica, a ruby coloured agua fresca. Agua de Jamaica makes a delicious syrup for hibiscus margaritas. Add 200g sugar and 350g agua de Jamaica to a pan and simmer until syrupy then leave to cool. For one margarita, add 25ml syrup, 25ml lime juice, 50ml 100% blue agave tequila and plenty of ice to a cocktail shaker. Give it a good shake, pour into a chilled glass and drink immediately! To make agua de Jamaica, add 50g hibiscus flowers to 1.5 litres of boiling water in a large heatproof jug or container. Stir in 125-150g of sugar, depending how sweet you want it, until dissolved. Cover and chill in the refrigerator overnight, then strain into glasses over ice before serving. Hibiscus is known as 'flor de Jamaica' in Mexico.